Nth Screen technology featured at Encounters Film Festival, in the form of Hazel Grian’s film Nth Bird. 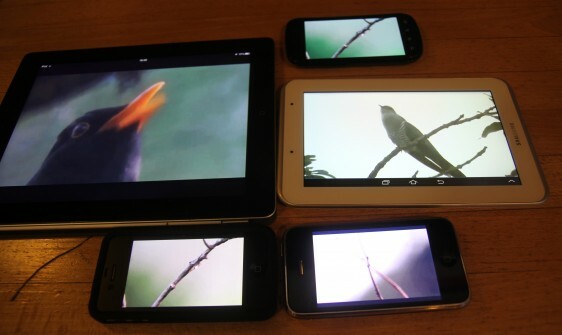 Nth Bird is a multi-segment film of lots of birds all singing at once in the same tree. When they hear a hawk they flit from branch to branch and when the hawk swoops they all fly away except one who is caught. But which one? It was created by filmmaker Hazel Grian for the Nth Screen platform in collaboration with Tim Kindberg (matter2media, Pervasive Media Studio) and Dr Charlotte Crofts (Digital Cultures Research Centre, University of the West of England), as part of of our 2013 REACT project. You can read an interview with us in Inside Encounters 3. Filmmaker Hazel Grian explains: “The ‘film’ is made up of different shots as you’d expect but in this case each shot is designed to be seen on a different phone simultaneously in the same room. So if two people put their phones side by side they’ll see two birds fly from one phone to the other and hear those two birds singing together until the hawk comes. If eight people put their phones together they’ll see and hear all of the birds. Hundreds of people could do it and hundreds of birds would be singing and flitting about a giant tree. People can put their phones into a tree shape or whatever pattern they fancy. Alternatively, just the sound alone makes you stop and listen and when people stand around a space with their phones it’s like being in a wood. And Tim Kindberg writes: “Listening to or watching and listening to Nth bird is a magical experience that I am proud to have been involved with. It is particularly satisfying to involve the audience in playing it. This is a core value behind Nth Screen: it’s a platform for creating and watching funny, beautiful, moving & magical videos that play across our phones while we’re together — the social value of being physically together is part of the experience.